Apple season is in full swing, so it’s the perfect time for this apple butter recipe for the crock pot! 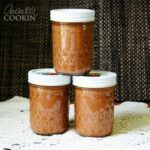 It’s an easy and delicious apple butter recipe that freezes well and has a lot of versatile uses you might not have considered. This slow cooker apple butter makes a pretty big batch, so you’ll have plenty to share with friends and family. Or keep it all for yourself because there are several ways you can use your crockpot apple butter. 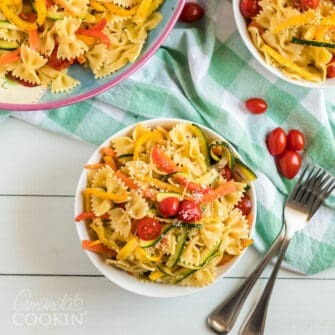 If you enjoy this recipe you will find a printable version at the end of the post that you can add to your recipe box for next apple harvest season! I used my iStir Automatic Stirring CrockPot for this recipe. 1. Peel and chop apples and place them in the slow cooker. 2. Pour honey over the apples and toss to coat. 3. Combine the spices and brown sugar and toss with apples and honey in slow cooker. 4. Cook on low 8-10 hours (overnight works great). 5. Stir in the vanilla extract cook an additional 2 hours with the lid OFF. 6. If you prefer your apple butter thick, keep cooking to reduce the liquid a bit. 7. Turn off the slow cooker and let the apples cool for a few hours. Ladle the cooked apple mixture into the bowl of a food processor (an immersion blender or regular blender works too but won’t make the mixture as smooth as a food processor will) and process for 2-3 minutes or until very smooth. 8. Pour into jars, add lids and store in the refrigerator for up to two week. Jars can also be frozen, just be sure to leave enough head space in the jar to allow for expansion. This is not a canning recipe and jars should be stored in the refrigerator. Use some of your crock pot apple butter to make apple butter popcorn or apple butter streusel muffins! Not into apple? Crock pot pumpkin butter is another delicious seasonal option. If you still have more apples left to use up, try making cake mix apple cobbler, apple cranberry crisp, or quick cranberry apple cobbler. Yum! This apple butter recipe for the crock pot is as easy as it is delicious. And it freezes well! Peel and chop apples and place them in the slow cooker. Pour honey over the apples and toss to coat. Combine the spices and brown sugar and toss with apples and honey in slow cooker. Cook on low 8-10 hours (overnight works great). Stir in the vanilla extract cook an additional 2 hours with the lid OFF. If you prefer your apple butter thick, keep cooking to reduce the liquid a bit. Turn off the slow cooker and let the apples cool for a few hours. Ladle the cooked apple mixture into the bowl of a food processor (an immersion blender or regular blender works too but won't make the mixture as smooth as a food processor will) and process for 2-3 minutes or until very smooth. Pour into jars, add lids and store in the refrigerator for up to two week. Jars can also be frozen, just be sure to leave enough head space in the jar to allow for expansion. I know you said this wasn’t a canning recipe but couldn’t I fill small canning jars with the hot apple butter and hot water bath them? My sister is allergic to most honey and I would like to make some of this to share with her. Any ideas on a substitute for the honey? How many cups chopped is this? A pound of apples will yield approximately 3 cups, so about 18 cups.